Breese had ample cause to try and recoup construction funds. Three days before reporting Stringham's diversion, Breese had received word that half of the Pennsylvania slate to be used in the magazine's roof was "unfit for use." The slate had been stored in the abandoned fort buildings. The floor in one of the structures had collapsed under the weight, and the slate had cracked. In late October, Breese still needed over 100,000 bricks, 490 casks of hydraulic cement, 1,200 bushels of sand, and a new shipment of 46 squares of 20-in. slate to complete the magazine. He pushed the completion date back to April 1, 1854 (BY&D, Letters Received, Box 158, Brown to Breese, October 28, 1853). On April 3, 1854, Breese reported that the magazine had been completed "according to specifications" and was "nearly ready for the reception of powder." 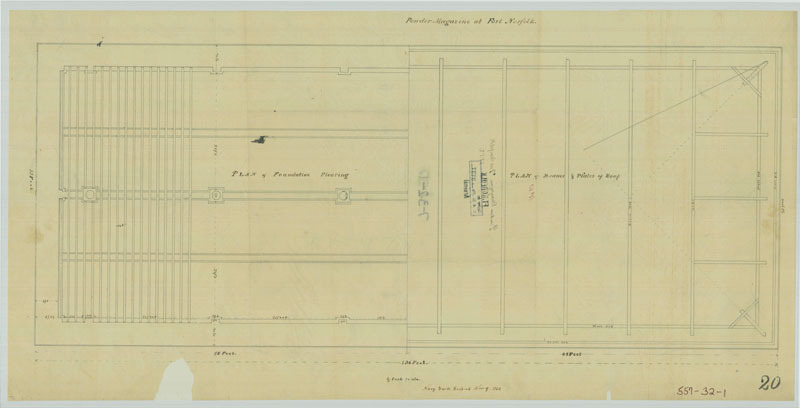 Still missing were the fixtures for the lightning rods, the storage racks for powder, and "some other conveniences for the Ordnance Bureau” (BY&D, letters Received, Box 158, Breese to Smith, April 3, 1854). In his fiscal year report, Breese stated that while he had not submitted the original estimate for the magazine, he felt it his duty to explain the delays and the excessive expense and materials. He declared that the new magazine was of a "most substantial and intricate construction." The original estimate had been submitted for a "different and far simpler building" than the completed structure. "Although perfectly plain in its architecture," he boasted that the magazine “ranks among the first class of buildings in the country for solidity and strength." The magazine was "covered in by spheroidal arches of great thickness supported on single granite piers." Breese also pointed out that the bulk of the labor had been "carried on through the unusually hot weather of the last season under all the disadvantages of excessive heat operating upon the workmen within the confined space of the high walls of the Fort." Finally, he repeated his allegations regarding his predecessor's improper use of the materials and the additional time and expense that this added to the project (BY&D, Annual Reports, 1855-1856, Report of S. L. Breese, June 28, 1854). 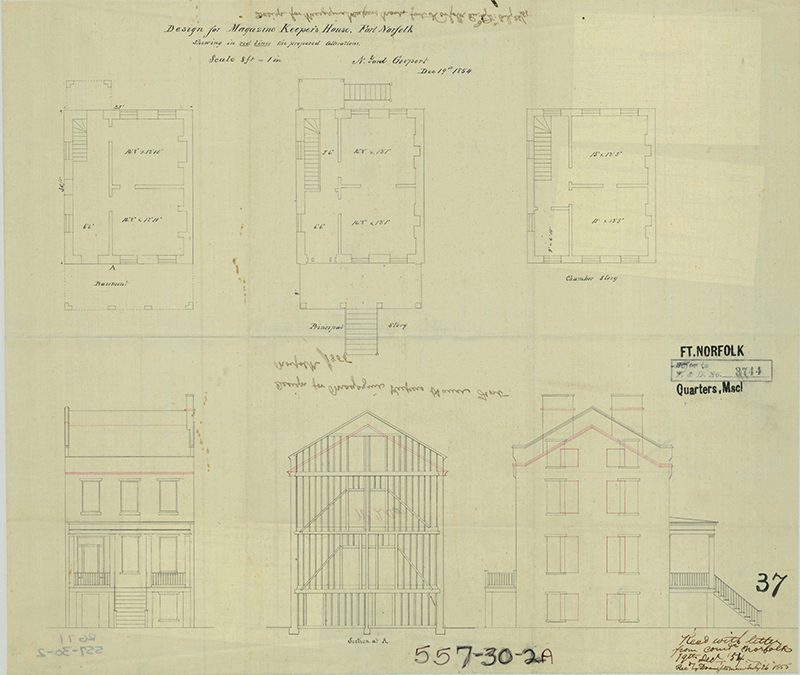 The bound volumes of the Bureau of Yards and Docks' annual reports for the 1850s contain plans for virtually ever other building and construction project undertaken by the Gosport Navy Yard. These records are replete with written references to the magazine building, but the plans of the structure were either not included or (in some cases) they have been removed. 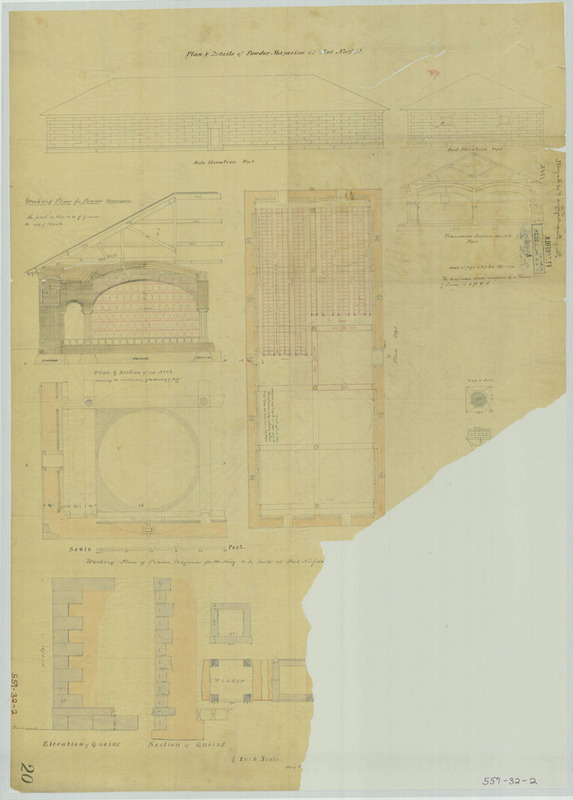 There are contemporary plans of the magazine in the National Archives. (see above).